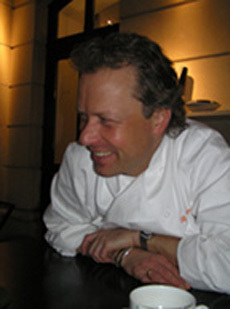 Chef Bobby Bräuer may have grown up in Munich, Germany, but he has grown professionally apprenticing at the #1 restaurant in Munich, working at Restaurant Fischerzunft in Switzerland, in Hong Kong at The Peninsula, at the Michelin Restaurant L'Oasis in La Napoule, France, at La Casa Nova in Cianciano Therme, Italy, and returning to Germany to work in Munich and Dusseldorf, before coming to Berlin to work at Die Quadriga. This creative chef finds culinary inspiration during his daily preparation time thinking about the menu with his staff, because chefs must always continue learning. 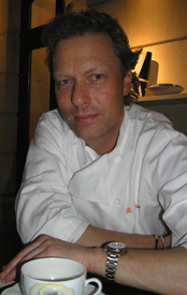 He believes in the importance of cooking with seasonal products, and that it is most important for a restaurant to be consistent with their quality everyday, and that maintaining quality is most important and also the most difficult. After many chefs trying Nouvelle, Fusion and the Laboratory Kitchens, he sees a new trend with chefs returning to their culinary roots. Chef Bobby returned to his roots using fish and meat and giving natural taste. Since Ferran Adria starting doing spumes, he said that everybody starting doing spumes. From time to time, it is nice to try different things as a chef, but not to copy other chefs. Since he moved to Berlin, when not working at the restaurant, he and his wife, also a Munich native, ski in the winter, enjoy discovering Berlin, going to the lakes in the summer and swimming, or just walking their dog, which they obtained from a dog shelter. There is an innate kindness in Bobby Bräuer that comes across the minute you meet him, even before you learn about the history of his dog. Chef Bobby Bräuer is presently at work on a cookbook that should be coming out next year, but said that it would not be a ‘real' cookbook but a combination of history, native cooking and table culture. I can't wait to read it! Preparation: Season the fish fillets and sauté them in olive oil. Blanch the asparagus in salted water, drain them and plunge in cold water, and then heat them in the stock from the fish. Put the pancetta slices on parchment paper on a baking sheet and roast them in a 160º C (325º F) oven, and cook until they are crisp. Blanch the basil, parsley and chervil in salted water, drain them and plunge in cold water, drain and then squeeze them in a cloth to remove the excess water. Mix the herbs with olive oil and salt and put through a chinois. Season with the crème fraiche, lemon juice and salt, and mix until it is frothy. Presentation suggestion: Place the sliced green apple in the center of the plate, top with the fish, drizzle the herb oil cream on the fish and around the dish. Crumble the pancetta and sprinkle around the fish. 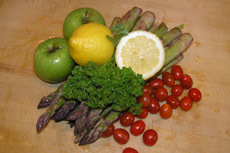 Serve the asparagus alongside the fish. Please read the in-depth individual articles on Die Quadriga in the Restaurants and Chefs' Recipes sections, and articles on Berlin in the Destinations, Hotels & Resorts, and Music Scene sections.